I get back to my desk from the board room where we just had our weekly management conference call. Its timing is horrible as it’s obvious none of the participants, including those who set it up, are ever up for it. There’s a lot of eye rolling, awkward bouts of silence and eventually when the call is done, the air around us suddenly feels lighter, breathable. The boardroom, which was a slaughter house a few minutes ago, is now a wingding. Except there’s no single malt. I call the nanny to speak to Xena. It’s Thursday and I had promised her that we would go watch a movie at the theatre after work. I need to confirm that she’s still down for it because its 21st century and these kids’ interests change at the drop of a hat. Like how she shocked us the other day when she publicly declared “for the last time, I don’t like cake!” to a mascot who was threatening the kids at a birthday party that anyone who doesn’t sing the birthday song loud enough will not get any cake. This is the same person who in the past would throw a tantrum at a party if they took too long to cut cake. So anyway, I must check that the idea of going to the theatre still appeals to her. I tell her that it’s wrong to compare people with animals and she just won’t back down. I decide to let go of this argument because life has taught me when to walk away. When the odds are against me. When my child outsmarts me. I am tempted to say “No, at my office.” But I know this sarcasm will be used on me soon so I opt to be nice. I don’t know where she is going with this question and I don’t have the energy to be creative with my answer. Ignoring her question, I ask her to shower and dress up and add that I would pick her up in a few. I log onto flix.co.ke. 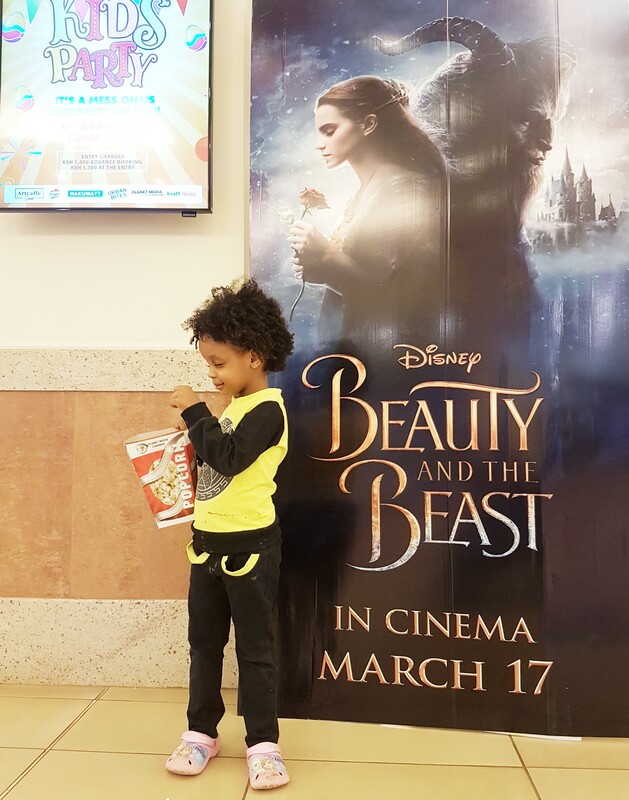 Beauty & The Beast is not showing at The Junction Mall which is closest to my house. Bummer. Luck may be on my side though as it turns out it’s showing at Prestige. Except that its slated for 6pm! I would only make it for that one if Peter Kenneth lent me his chopper. Westgate, 6.30pm. I am willing to give this one a shot. I literally skid out of the office, jump into my car and drive like a maniac. At least there is almost no traffic on my way home. I screech to a halt outside the house at exactly 5.55pm. I am fresh, in my sweat pants and ready to have a blast at the theatre with Xena, but only if I can get us there on time. I detest being late for a movie and I get distraught if I miss the trailers. It has taken only 18 minutes to drive from Kile to Westgate on a Thursday after 6pm!! God is working overtime for us today. At the security checkpoint, Xena coils in her seat when the sniffer dog advances towards her. At the counter, we are promptly informed that there’s an offer where you pay Ksh 650 for a ticket and a KFC meal. A ticket on its own goes for Ksh 550.It doesn’t take a math wizard to figure out that this is the best deal in town. Caramel popcorn, skittles and a cold Krest. Yes that will be it. Where should I pick the KFC meals again? 2nd floor. Great, thanks. 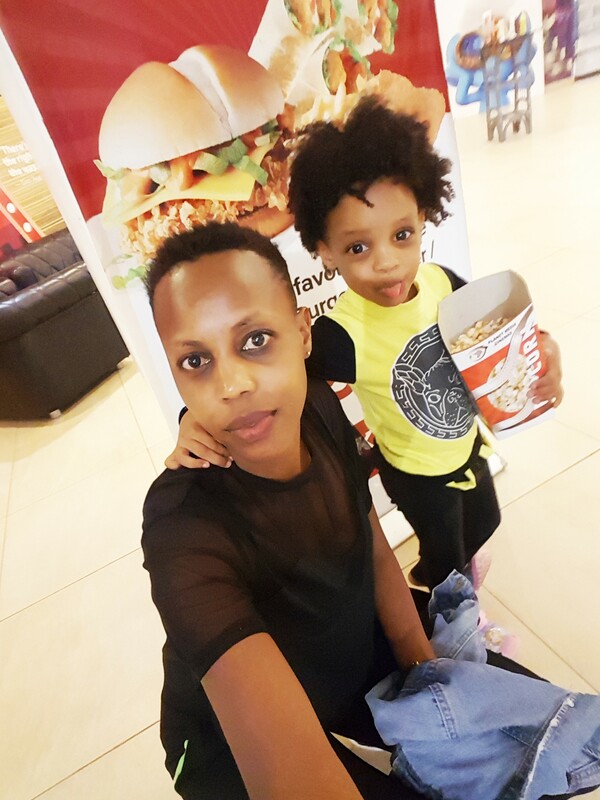 We head to KFC and I get myself the two piecer chicken and chips and a burger for Xena, but we end up exchanging the meals eventually. We take our seats and I promptly spread out our feast on our laps. Thank God, the seat next to me is vacant so I place my handbag, our jackets and the popcorn on it. Xena devours the chicken and struggles with her 3D glasses as they are too wide for her tiny face. I stick them through her thick hair as opposed to placing them behind her ears. Problem solved. As if on cue, the last advert fades away and the movie starts. We have missed the trailers but I am not going to beat myself up about it because surely the fact that we even made it for the movie is a miracle. I switch my phone to airplane mode, throw on my glasses and finally lean back. The escape from my world begins. Vulnerability checks in. 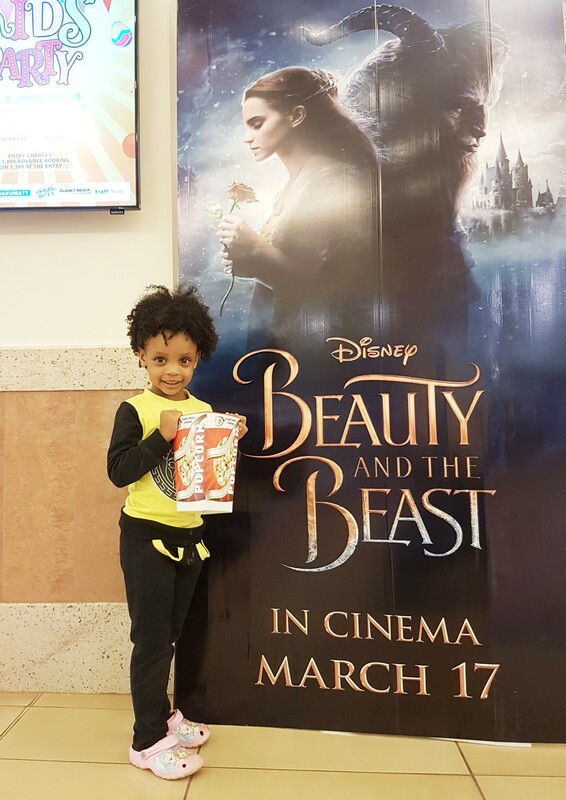 Beauty & The Beast Blew me away and the fact that Xena enjoyed it so much yet it was not animated made it worthwhile. You know she’s having a good time when she is seated asking questions throughout the entire movie, otherwise she gets off her seat and walks around the theatre. Make a point of watching it in 3D. It has great father/daughter lessons which Xena surprisingly took in based on the questions she asked me on our way home. It will remind you that love is a beautiful thing, in case you have forgotten. How cute is your lil one?! My girls also loved the animated version, so going to see the new film in the theater was an absolute must! Isn’t it great to be able to share those moments together? You and Xena are mommy and daughter goals!! Taking notes like maaaad!! You know where to find her! I think its a thing with this generation because my 3 year old baby girl loves Moana too, its the only movie she will watch sitting still. Moana is everything. My 4yr old has its theme song on repeat on her youtube playlist, we use it to wake her up almost every morning. IKR? It’s funny how quickly it replaced the frozen craze! I agree. A friend of mine told me how her four year son loved Moana but threw a tantrum when they watched Sing. I love Xena! She’s sooo smart.